A quick breakfast you can take to go! Kids love this breakfast! 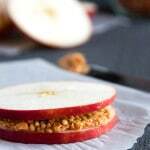 Slather each thinly sliced apple round with peanut butter. Sprinkle granola onto 2 of the slices, and press the sandwiches together. Recipe yields two apple sandwiches.